The University, in general, remains in operation and continues with regular activities, classes, and services despite excessive snow accumulation or a winter storm. 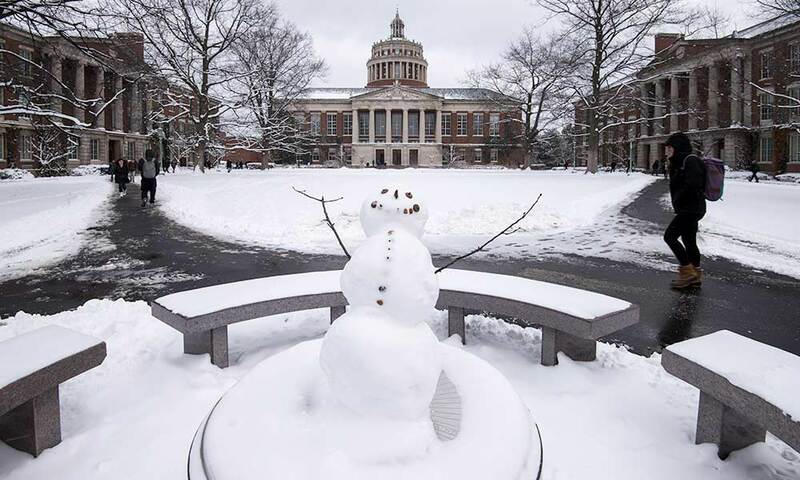 The University is somewhat legendary for its winter weather resilience (Rochester Review 2015: “Can We Have a Snow Day?”) and is recognized by the National Weather Service as being “StormReady,” which means that in addition to being really good at snow removal, the University also has commendable plans for analyzing winter forecasts and conditions, and keeping everything running well. However infrequent, there are times when the University does reduce or delay its operations and cancel activities due to really severe weather. In these cases, AlertUR, the University’s official emergency notification system, is the first notice of any University-wide status changes. AlertUR sends urgent messages via text, phone call and email. Now is the time to update: To receive AlertUR messages, University community members must keep their AlertUR phone and email settings current. Students, faculty and staff can use their NetID to update their settings any time at rochester.edu/alertur. Key: all essential University staff members are still expected to report to work unless otherwise notified by a supervisor—employees are encouraged to work with their supervisor to understand their essential or non-essential status. All Medical Center employees–whether at Elmwood Avenue or any off-site location–are considered essential staff and are required to report even during severe weather, unless notified otherwise. Blackboard: Students should also check Blackboard for individual class cancellations as determined by an instructor. University Facilities works around the clock to ensure that the University is accessible and safe in the event of a big snow event. However, if an individual feels it’s unsafe to travel to campus, they should notify their professors or supervisor to work out the necessary arrangements for their absence or delay. Weather reports are monitored continuously by trained University officials.They are looking at the severity of current conditions and predictions; expected duration of a storm; road conditions, both on campus and in the region; and how quickly snow can be cleared from sidewalks and parking lots. To understand the full decision-making process involved with a possible snow day, see: http://www.safety.rochester.edu/homepages/ep_homepage.html#weather. « Has Apple lost its sweet spot?